Filed to: what could possibly go wrong?Filed to: what could possibly go wrong? So you know those wacky videos they show every year of some Red Bull event where silly folks try to fly their homemade "airplanes" off a 30-foot cliff? (The 10 best crashes are here.) That's called The Flugtag, and this year, Clay Travis, of CBS Sportsline Claynation fame — and our own Tennessee Titans preview — is entering this year's "competition" in Nashville. The goal is to break the Wright Brothers' 120-foot flight. 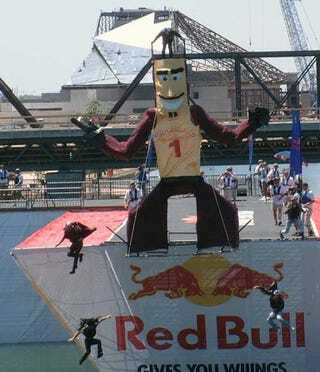 The Flugtag record is 78 feet. We're not sure he's gonna make it.